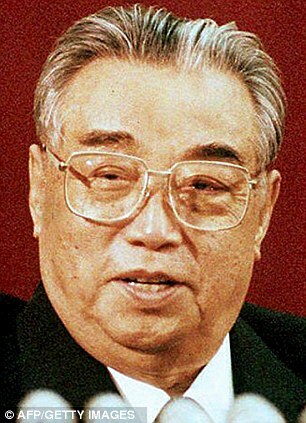 Even though he has been dead since 1994, the late Kim Il Sung remains the President of North Korea, general-secretary of its ruling communist Worker’s Party of Korea and chairman of the Central Military Commission. His preserved and embalmed body lies under a glass coffin in a public mausoleum at the Kumsusan Palace of the Sun. The total control of the North Korean government, however, has been turned over to Kim’s oldest son, Kim Jong-Il, who has apparently carried on his father’s “cult of personality” under his personal philosophy of Juche. While North Korea was first organized under Kim under a Communist philosophy, Kim invented his own system of socialism identified as Juche, which means Korean patriotism and self-reliance. While the philosophy appears to urge each individual to become self-reliant, Kim IL-sung demanded loyalty to himself as the supreme leader. Kim ruled North Korea for 46 years. In the early years, when he maintained a close political and economic link with the Soviet Union, North Korea prospered. But as Kim leaned more and more into his philosophy of self-reliance, and as the old Soviet Union broke down, Kim’s regime fell into financial difficulty. As a young man, Kim joined the Chinese Communist Party and became active as a commander of a small guerrilla force that resisted a Japanese effort to take over Manchuria. He then served as a Major in the Soviet Red Army and maintained that post until the end of World War II. Then in 1945, the Soviets appointed Kim as chairman of the North Korean branch of the Korean Communist Party. Once positioned in North Korea, Kim established the Korean People’s Army. He recruited guerrillas and former soldiers who had fought against the Japanese. Stalin equipped his growing army with modern Soviet-built tanks, trucks, artillery and small arms. Kim even established an air force that eventually was equipped with MiG-15 jet fighters. In 1950, Kim’s new army invaded South Korea, the United Nations and United States got involved in defending the South Koreans, and thus began the ugly Korean War. By the time a “cease-fire” agreement was reached, with both military forces were dug-in at the thirty-eighth parallel. Korea fell into a long and uneasy truce in a war that never officially ended. By then an estimated 2.5 million people, both soldiers and civilians, were dead. The war left North Korea devastated. Kim launched a new economic plan with all industry and all agriculture owned by the state. There was an internal struggle for control of North Korea and several rival leaders were “purged.” It was at this time in 1955 that Kim delivered his speech outlining his new Juche philosophy. In 1956 Kim successfully resisted attempts by the Soviet Union and China to depose him, and thus his grip as North Korea’s leader was solidified. During the Vietnam conflict, Kim studied the North Vietnam’s successful form of guerilla warfare and decided to try something like that against the South Koreans. Thus there was new tension at the demilitarized zone and the capture of the US spy ship Pueblo and its crew became a national incident. Because of Kim’s Juche philosophy, North Korea cut itself off from all forms of international trade. Consequently, a lot of people starved. There was mass suffering. Yet Kim managed to build and maintain a million-man army which remains in place today. By the time Kim died of a heart attack in 1994, some experts have estimated that over a million North Koreans perished in concentration camps, forced labor and from executions during his regime. Yet Kim is still celebrated as the nation’s “dear leader,” his birthday is a national holiday, and statues and images of the man can be found everywhere. Kim was a mass killer throughout his life, but the people were programmed to love him anyway.